Technology | WIZnet Co., Ltd.
위즈네트의 Hardwired TCP/IP 는 소프트웨어 기반의 인터넷 연결 솔루션보다 향상된 성능과 안정성을 제공합니다. 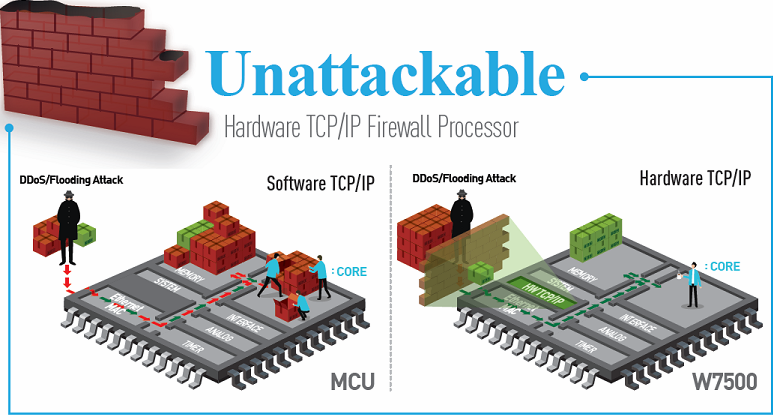 사물인터넷 (IoT) 을 위한 최적화된 기술인 Hardwired TCP/IP 의 주요 특징은 Unattackable, High Performance, Easy to Use 로 정의될 수 있습니다. WIZnet (Wizard of Internet) 은 IoT를 위한 Internet Connectivity Solution 을 제공합니다. 위즈네트의 핵심 기술은 “Hardwired TCP/IP“입니다. 위즈네트의 Hardwired TCP/IP solutions 은 다른 소프트웨어 Internet connectivity solutions보다 훨씬 더 뛰어난 성능과 안정성을 자랑합니다. 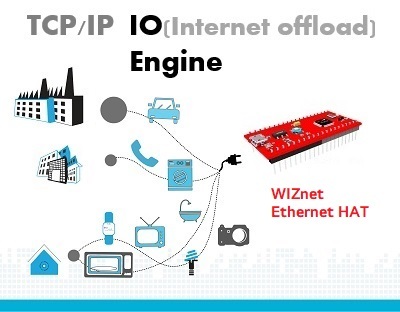 위즈네트는 IOT (사물 인터넷)을 위한 IOP(Internet offload Processors)를 개발 합니다. IOP 는 Hardwired TCP/IP가 내장된 MCU 칩으로 최적의 성능으로 간편하게 인터넷 기능을 구현할 수 있습니다. 위즈네트 Hardwired TCP/IP칩은 Flooding, Spoofing, Injection 과 같은 네트워크 공격을 원천 차단, 가장 안정적인 하드웨어 네트워크 엔진입니다. Ethernet MAC Layer에서 TCP/IP Layer까지 하드웨어 로직으로 구현된 TOE (TCP/IP Offload Engine) 엔진이 네트워크 공격을 블러킹 (Blocking) 함으로써 시스템의 보안을 보장합니다. Hardwired 된 TOE(TCP/IP Offload Engine) 는 소프트웨어 TCP/IP stack solution 보다 굉장히 뛰어난 성능을 자랑합니다. 차트에서 보여지듯이 Syn-flood 공격이 가해지면 소프트웨어 기반의 TCP/IP 솔루션은 성능에 큰 변화가 있지만 위즈네트의 TOE 는 변동없이 고성능을 유지합니다. 위즈네트는 다양한 network protocol libraries 와 유용한 tutorials / application 예제들을 제공하고 있습니다.